The SEC uses comment letters to raise concerns or questions regarding specific elements of a public company’s financial filings. SEC staff correspondence is especially prevalent in a company’s first filing to go public—the form S-1. Your S-1 will likely need to go through multiple iterations of receiving and resolving SEC staff comments before it is finalized. The SEC staff may provide comments on the entire filing—including accounting, legal, and banking matters. 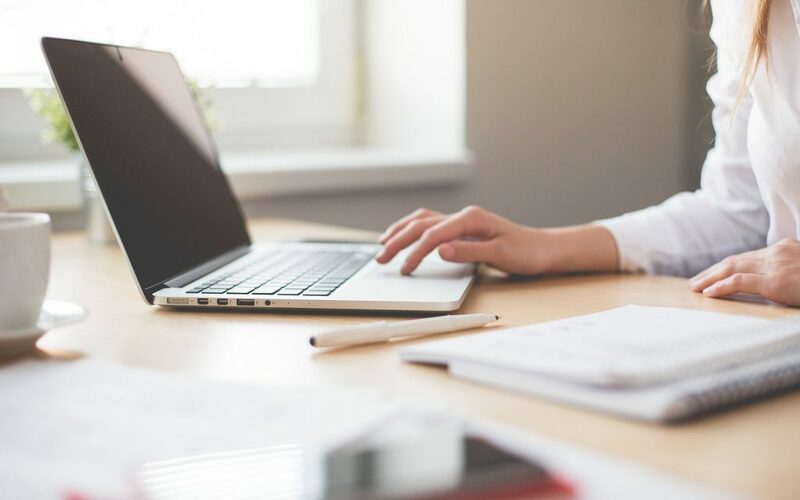 This article will outline some of the common financial reporting-specific pitfalls that companies encounter during the initial S-1 filing with the hope that such knowledge will help you expedite your filing process. First-time filers are often unfamiliar with these more complex rules and regulations, so this article intends to provide a basic understanding of some of these principles to aid in discussions with your financial reporting team throughout the registration process. In another study1, Deloitte identified five accounting-focused elements of the S-1 filing on which IPO registrants commonly receive SEC staff comments: (1) registrant financial statements, (2) public-entity disclosures and transition provisions, (3) distributions to owners, (4) changes in capitalization, and (5) dilution disclosure. The following sections will provide an overview of some elements that may require additional consideration in each of those five categories. For more detailed information on how to draft an S-1, see our article Drafting an S-1. One of the most important elements of the S-1 is the audited financial statements. The three primary types of statements are the consolidated balance sheets, the consolidated statements of income and changes in financial positions, and the changes in stockholders’ equity and noncontrolling interests. Additional supplementary statements and schedules may be required based on your company’s individual facts and circumstances. You are responsible for providing the most current financial data throughout the entirety of the IPO registration process. The presented financials must be dated within a certain number of days relative to both the S-1 filing date and the date the registration is considered effective; otherwise, you can expect to receive a request from the SEC staff for more updated filings. 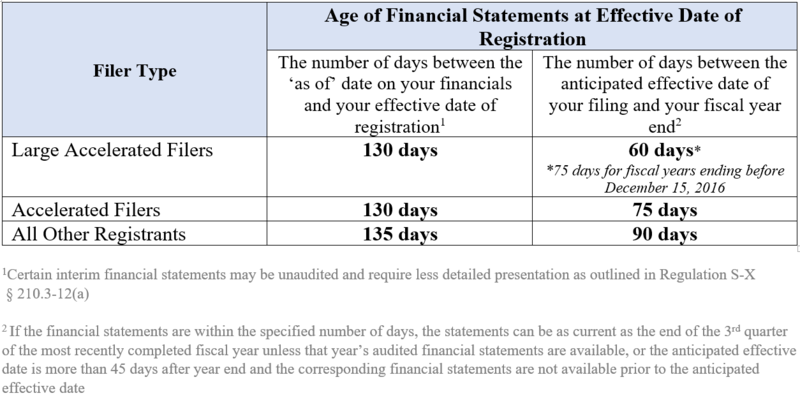 The number of days before the financial statements become ‘stale’ (Regulation S-X, Rule 3-12) are presented in the table available here. For an interactive ‘stale-date’ calculator, visit our article Audit Prep for the Big Leagues. The following two sections will discuss the statements that may need to be submitted if your company is initiating an IPO that involves a change to an existing company. The SEC Division of Corporation Finance Financial Reporting Manual (FRM) outlines specific rules as to which financial statements need to be included when a predecessor situation exists. Section 1170 of the FRM defines a predecessor situation as one in which, “…a registrant succeeds to substantially all of the business (or a separately identifiable line of business) of another entity (or group of entities) and the registrant’s own operations before the succession appear insignificant relative to the operations assumed or acquire.” The determination of which entity or entities should be classified as the predecessor depends on the individual facts and circumstances of your registration. Audited financial statements of the predecessor are required for all periods required to be included in the S-1 prior to the succession. If the IPO registration statement of a successor company is filed at some interim point during the year, the predecessor does not have to furnish comparative financial statements for the correlating partial period of the prior year. According to the FRM, carve-out situations also require additional consideration. As the name suggests, a carve-out situation is one in which the parent company separates, or “carves out,” a section of its operations to prepare for the sale, spin-off, or IPO of that segregated section. Because the segregated section is then treated as a distinct entity, its own set of financial statements must be prepared. Even if the parent has not historically accounted for the carve-out separately, if you, as the registrant, relied on the parent for certain functions, your historical income statements should include all costs of doing business, including expenses incurred by the parent on your behalf. If it is not practicable to individually identify all associated costs of doing business, the SEC expects you to reasonably allocate the expenses between the parent company and your company. Essentially, in an IPO, you are tasked with providing your investors with the most complete picture of the carve-out situation. So, although the specific composition of a set of carve-out financials may require significant judgment, it is important to remember that the underlying purpose of these financials is to accurately reflect the assets and operations of your newly registered company. The financial statements you recorded as a non-public company will likely not be sufficient for an IPO if they were not completed in accordance with GAAP as it applies to public business entities, as defined by the Financial Accounting Standards Board. The financial statements presented in your registration statement must comply with US GAAP accounting principles and disclosures required for public companies for all periods presented. It is important to recognize that as a public company, there are not only differences in required accounting principles, alternatives, and disclosures, but also in the effective dates of new accounting pronouncements. If your registration filing will be completed after the public company effective date of a new pronouncement, you are required to retrospectively change your date of adoption for that standard to the date required for a public company. There are some exceptions to this requirement for JOBS act filers—for more information, see our article The JOBS Act. Your nonpublic company may not have been fully compliant with the disclosure requirements of Regulation S-X and SEC staff views in SABs (Staff Accounting Bulletins). Regulation S-X outlines the required form and content of financial reports, especially public company financial statements. As a registrant, you must ensure that your filing is in accordance with these requirements for all periods presented. Some important requirements to consider may include: balance sheet and income statement presentation requirements, pro forma financial statements, income tax expense composition, and related-party disclosures. Section 3420 of the FRM states that a pro forma balance sheet reflecting the distribution accrual is to be provided in addition to the historical balance sheet if, “…a planned distribution to owners, regardless of whether it has been declared or whether it will be paid from proceeds, is not reflected in the latest balance sheet but would be significant relative to reported equity.” Further, if a distribution will be paid out of proceeds rather than earnings, pro forma EPS should be presented—to the extent that the amount exceeds the current year’s earnings3—along with historical EPS, even if the distribution has neither been declared nor reflected in the balance sheet. That is, pro forma EPS is required if the dividend will be paid out of the proceeds because additional shares are needed for the owners to receive the distribution (which is in the form of those same shares). This event affects EPS because an increase in shares outstanding necessarily increases the denominator in the EPS calculation. So, if you are planning to distribute earnings to the owners as of, or immediately before, the closing of an IPO, you will need to have a pro forma balance sheet that reflects the planned distribution, in addition to the historical balance sheet and EPS information. Changes in capitalization that occur before, or concurrently with, the effective date or closing of an IPO may be either a retrospective adjustment presented in the financial statements for all periods presented or a prospective application that is not reflected in the IPO filing. If you determine that a material change in capitalization has occurred after the date of your last balance sheet, you will need to include a pro forma balance sheet that reflects the change in capitalization in addition to the historical balance sheet in your filing. Examples of changes in capitalization include a stock split, the redemptive or automatic conversion of preferred stock into common stock, or the conversion of debt to equity. If the change results in (a) the material reduction of permanent equity, (b) the material reduction of EPS (before considering the effects of the IPO stock offering), or (c) the redemption of a material amount of securities, the pro forma balance sheet should reflect the effects of the change in capitalization but should not include the effects of the offering proceeds. In general, the SEC will not accept an auditor’s report that contains restrictive language (e.g., “draft”). However, the SEC has made an exception if a material transaction is expected to occur prior to the effective date of registration, so long as that transaction is already reflected in the historical financial statements. In this case, the SEC will accept a “draft report.” The draft report will be in the same form as a standard registration filing but includes an additional preface that states the registration was filed prior to the occurrence of the material transaction. Although the SEC will accept this filing, the preface must ultimately be removed for the filing to be finalized. When securities are issued in a public offering at a price that differs significantly from the effective cash cost to officers, directors, and other similar affiliates of the company, additional disclosures are required (Item 506 of Regulation S-K). Some components of these disclosures are not explicitly defined in the authoritative guidance, so significant judgment is required to determine their respective values. Because the comment and response process can be very time-intensive, the NYSE IPO Guide recommends considering a prefiling conference. This conference allows your company to discuss issues—often accounting or financial presentation matters that either will frame the financial statements or will require SEC staff accommodation—with the SEC staff before the first filing. By taking the time to discuss the areas of greater complexity or uncertainty specific to your company with the SEC staff prior to the first filing, you can reduce the amount and extent of corrections to your S-1. As noted at the beginning of this article, the explanations provided herein are not intended to serve as a comprehensive guide addressing the specific accounting complexities of your company that may result in SEC staff comments; rather, this article intends to draw your attention to the potential areas of complexity that you should discuss with your financial reporting team while preparing for your IPO. Although the SEC review of your S-1 is an iterative process, an awareness of the SEC rules and regulations that newly registering companies often struggle with will help you take your company public faster. 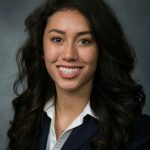 Audit Analytics, Jessica Mckeon, “Common Topics in IPO Comment Letters.” January 20, 2016. Deloitte, “SEC Comment Letters—Including Industry Insights: What “Edgar” Told Us.” October 2015. Latham& Watkins, KPMG, “Financial Statement Requirements in US Securities Offerings: What You Need to Know.” 2017. New York Stock Exchange, “NYSE IPO Guide.” August 16, 2013. SEC Division of Corporation Finance, “Draft Registration Statement Processing Procedures Expanded.” June 29, 2017. SEC Division of Corporation Finance, “Financial Reporting Manual.” August 25, 2017. The study appeared in the most recent edition (October 2015) of the publication, SEC Comment Letters—Including Industry Insights: What “Edgar” Told Us. An already declared dividend is assumed to be paid from earnings unless the dividend amount exceeds the current year’s earnings.